Preheat oven to 220 C / 428 F. Melt the butter in a saucepan. Stir in flour to form a paste. Add water, caster sugar and brown sugar, and bring to the boil. Reduce temperature and let simmer. Roll out the pastry to line the bottom of a 23cm (9 in) pie dish. Fill with apples, mounded slightly. Cover with strips of pastry to form a lattice design. Gently pour the sugar and butter liquid over the pastry. Pour slowly so that it does not run off. 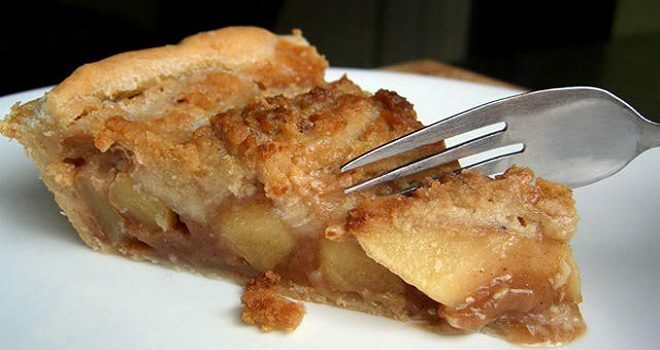 Bake the apple pie 15 minutes in the preheated oven. Reduce the temperature to 180 C / Gas mark 4. Continue baking the pie for 35 to 45 minutes, until apples are soft. Serve apple pie with ice cream or custard. To check the doneness of the pie filling, insert a knife into the centre of the pie. If it meets with little or no resistance, the pie is done. If the pie is not quite done but the top or edges are becoming too dark, loosely cover the top of the pie with aluminium foil to shield it from the heat. If you want to add shine and sparkle to your apple pie, thin 4 tablespoons of golden syrup with very hot water. When the pie is done, brush the thinned syrup over the top of the pastry. You can add granulated sugar or demerara sugar at this time. Return the pie to the oven for 2 to 3 minutes to let the glaze dry and set. Once the pie is done baking, let the pie cool to room temperature before slicing to allow the pie filling to set.